Here we go, it’s final day tomorrow! Host Japan bags 1 title through All Japanese final in the Women’s Singles category. Zhang Nan, Zhao Yunlei and Christinna Pedersen will play two finals with their respective partners. The overwhelming favourite Zhang/Zhao continue their impressive record for this year, reaching 4 finals of Superseries events taking 3 titles at Birmingham, Kuala Lumpur, Singapore and beaten finalists in Jakarta. Their opponents tomorrow are none other than familiar foes, Fischer/Pedersen. Both pairs eliminated their lower ranked Korean pairs in straight-sets. It’s going to be close match but the world #1 have the advantage to defend their title here due to their fine form in last 12 months. Japanese starlets create history in making an all Japan affair on homesoil. This is a repeat of the 2012 world junior championships final back when Okuhara defeated her younger compatriot. Both Yamaguchi and Okuhara had difficult semifinal clashes against their more established opposition Wang SX and Tai TY respectively, three of the games being only two points in difference. Okuhara is favoured to win over former champion Yamaguchi based on previous match statistics. Both players have similar fighting spirit and also beautiful dropshots. The battle of the different generations, former champion Lin Dan who looks in good shape here will try to regain his 2006 title against 21 years old Danish rising star Viktor Axelsen. Last meeting in Sydney, the two times Olympic Champion lost to Axelsen at first round. This is the third Superseries final in 2015 for the young Dane after the Indian Open and Australian Open where he suffered losses to Srikanth and Chen Long respectively. It will be an interesting to watch the explosive Axelsen against the vastly experiences Lin Dan. It’s been a tricky test for the Danish combination this year in facing a rotation of new Women’s doubles partnerships from China. Against each pair, Pedersen/Juhl has played well resulting in them being recent World Championships silver medalists. It’s fantastic result for Zhao/Zhong to cruise into last round in their first international tournament appearance but big question for us whether this will be a permanent pair. The last final is expected to deliver close contest between two pairs, a rematch of Danish Premier Superseries final last year. Having three finals in All England, Singapore Superseries and Indonesian Premier Superseries in 2015, Fu/Zhang have had pretty convincing performances during this season. 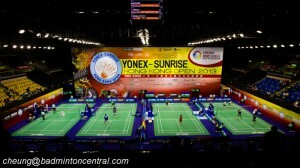 Let’s see whether they are able to turn silver to gold tomorrow against the defending champion and strong favourites. Lee YD/Yoo YS have won 1 Superseries title so far in this year, that being the Australian Open and runner up in the Malaysian Premier Superseries.